*This section explains how the transaction data is inquired and verified based on the grouping parameters defined in the previous section. Once the grouping parameters are defined, post the various projects transaction types such as hours, fees, items, expenses etc. These transactions will be grouped based on the setups and can be viewed on the ledger updates form. 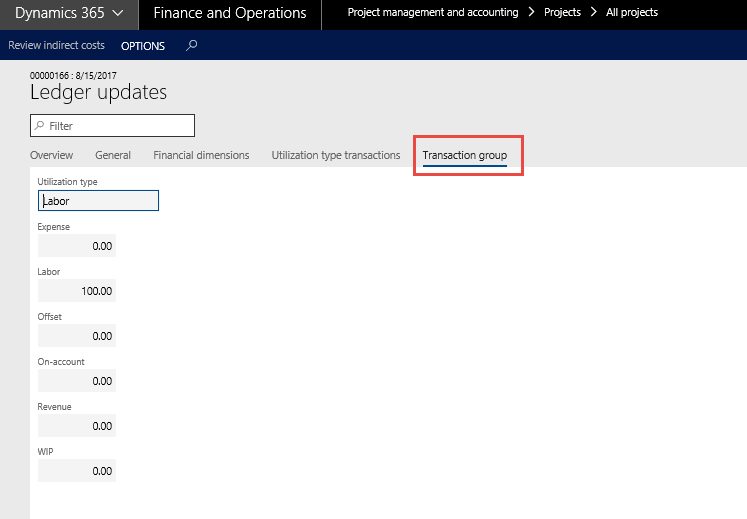 Utilization data classified based on the setups in Utilization types and transaction groups for the posted transaction is available in the Posted Project Transactions form. Two new tabs on view ledger update under posted transaction form show the utilization type transaction and utilization group for posted transaction. Utilization type transactions tab is added in View ledger updated form to view the transactions posted using category which is defined in the Transaction type setup form. Transaction group tab is added in View ledger updated form to view the transactions posted using posting type which is defined in the Transaction group form.